The suburban corporate headquarters campus is a common development model found across the US and abroad; and for a number of good reasons. The large volume of building and parking required for the hundreds of executives and staff coupled with the economic and logistic benefits associated with greenfield sites located at the perimeter of a city, make it an easy decision to establish headquarters out of the city core. When faced with the challenge expansion, the Grange Insurance Company considered this option but based on their commitment to the neighborhood, decided to keep their US headquarters in the city and invest their energies in the environment they have resided in for decades. 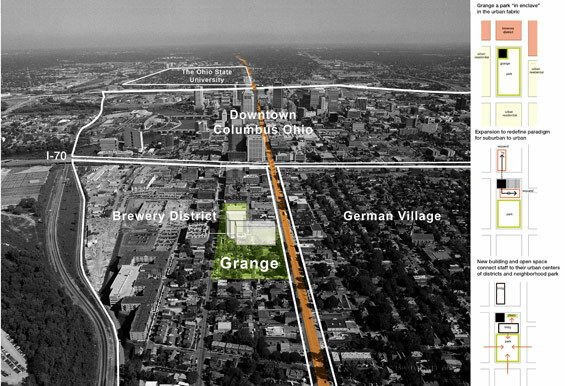 The Grange Insurance Company has been a key contributor to the Columbus (Ohio) economy and the city fabric since its beginnings in 1935. 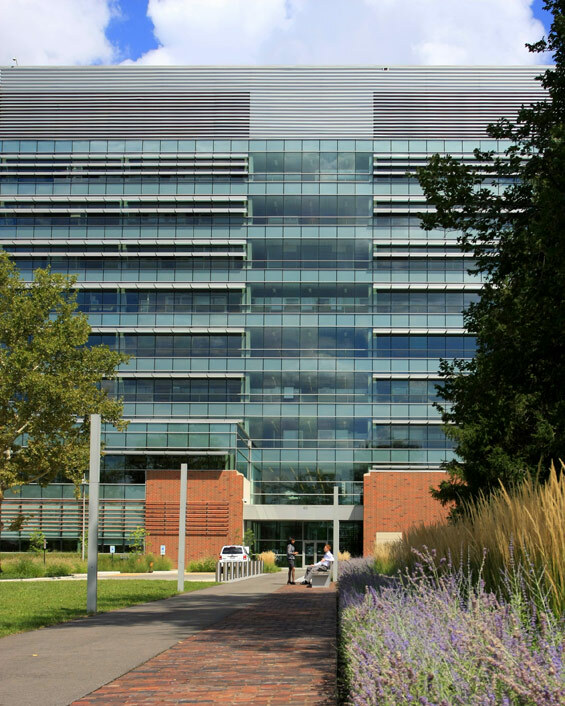 Located at the southern edge of downtown Columbus, the existing campus, since the 1970’s, has consisted of a 10-storey office tower set in an urban park setting adjacent to the historic and economically emerging Brewery District. With the decision to expand and modernize its headquarters’ facilities, the company determined that it would remain at its existing location adding over 23,000 sm of new office space and staff support facilities along with a new 1,000 space car park and significant site improvements. The nbbj design team sited a new 11-storey office addition in close proximity to the city’s most dominant north/south street to enhance the company’s presence as a significant city landmark while exploring ways the design of the new expansion could add urban energy to the adjacent historic Brewery District. 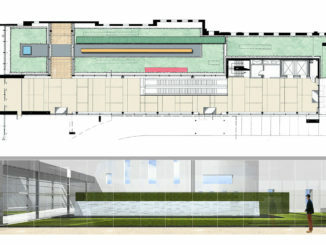 The new addition’s perpendicular orientation to the existing building frames a new urban plaza positioned toward the district that serves as a respite and event space for the enjoyment of the company’s 800 employees. These new architecture and landscape interventions were catalysts for conceptual shift that has transformed the campus from its original suburban character to an vibrant urban headquarters connected to its established urban context. The plaza’s location adjacent to the corporate lobby, multipurpose room and cafeteria, make it an attractive and accessible outdoor amenity serving a multitude of venues from charitable events, to seasonal celebrations and corporate gatherings. 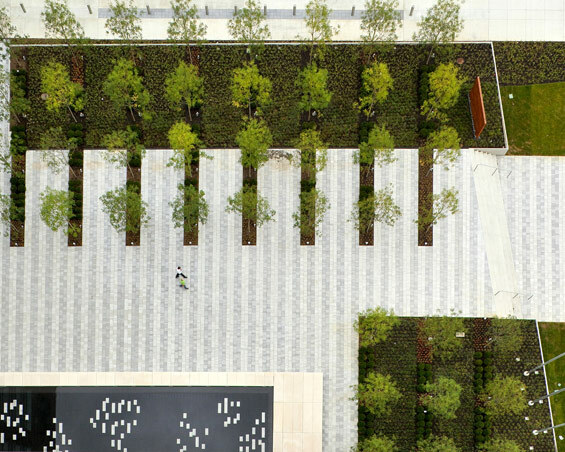 The space is composed of a long, low profile reflecting pool, a gridded grove of upright Liberty Elms, rectangular beds planted with low evergreen hedges and groundcovers, thin profile architectural concrete walls and a plaza surface consisting of finely textured precast pavers arranged in a subtle, textured linear pattern. The plaza’s components are executed with a high level of craft to ensure longevity and express the Grange brand as a company committed to quality. In an effort to re-engage a key part of the site’s historic urban fabric, the corporate lobby was developed on what was formerly Wall Street. 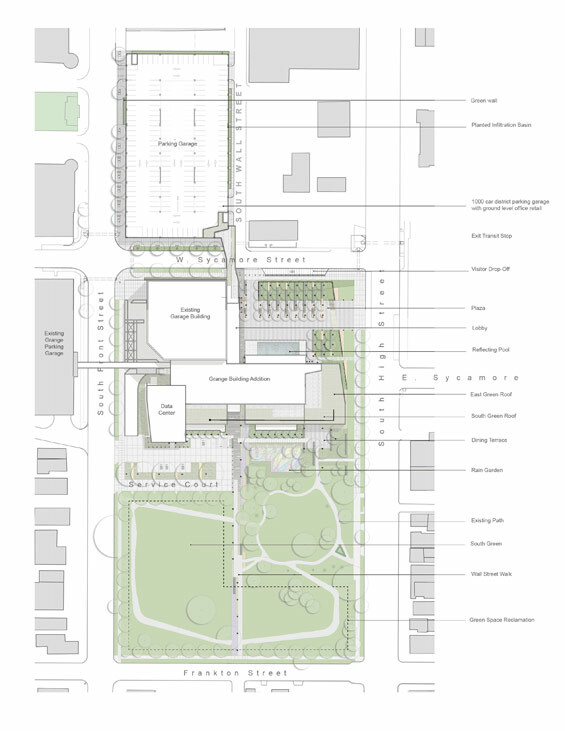 The redesigned corridor was also constructed to become the main pedestrian path that connects the new Grange car park to the corporate lobby, as well as the Rain Garden, Service Court and South Green beyond which then transitions to a well-established residential neighborhood. Beyond the corporate lobby, Wall Street’s paving materials transition from bluestone and precast pavers as the path moves southward between the Service Court and Rain Garden to asphalt and repurposed brick pavers from the original street. A bold arrangement of Dwarf Bamboo, Feather Reed Grass, Black-eyed Susan and Russian Sage follow the path in a shifting linear pattern emphasizing a north-south grain. The path is punctuated with columnar pedestrian lights and contemporary benches of wood and steel. 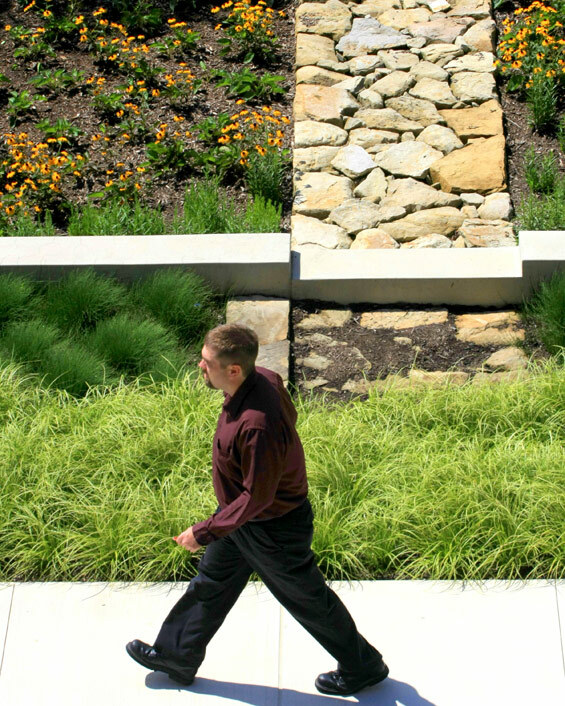 A 500 sm Rain Garden is situated between the Dining Terrace and Wall Street Path and serves as a highly visual functioning environmental feature on the Grange campus. 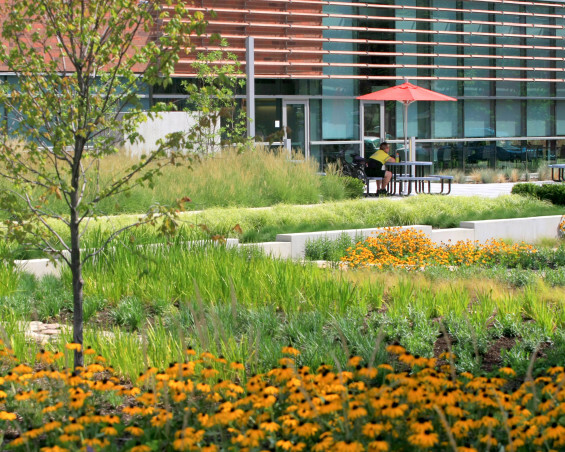 Working hand-in-hand with the building’s green roofs and a below-grade detention piping system, the RainGarden slows the erosive forces of storm water while enhancing water quality. Water is conveyed from roof scuppers through architectural concrete runnels leading to the multiple basins that make up the Rain Garden. A notched weir constructed of architectural concrete controls water flow into the lower basin where it pools to a depth of 14 inches before percolating to the detention pipes below. Aligned with the notches, crafted rectangular stone planks prevent erosion and provide a contrasting element to the sweeping masses of wetland plants in the lower basin. 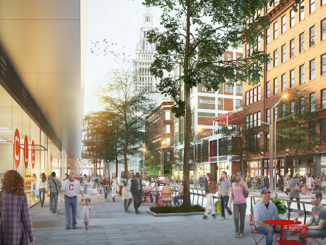 Flood-tolerant canopy trees in the lower basin will provide shade to the dining terrace and adjacent walks as the landscape matures. 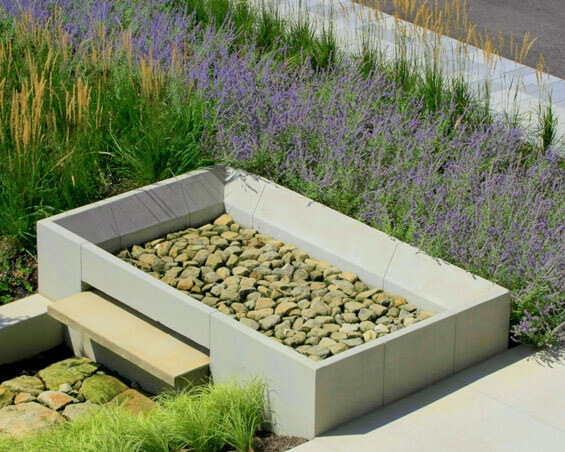 Plants utilized in the garden basin are water and drought tolerant species, low in stature with aesthetic qualities of texture and seasonal color that draw attention to the space. This stormwater management system reduces the amount of rainwater exiting the site by over 30% which helps recharge the local aquifer while reducing the impacts on-site stormwater may have on flooding within the nearby Olentangy River corridor. 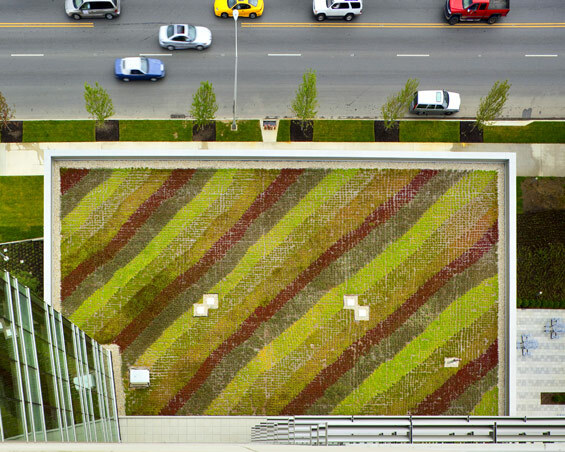 Three green roofs located just outside the offices of the second and third floors are composed of a diverse palette of contrasting sedums arranged in bold geometric patterns. The green roofs absorb storm water while reducing heat island effect and are a visual treat to Grange staff. 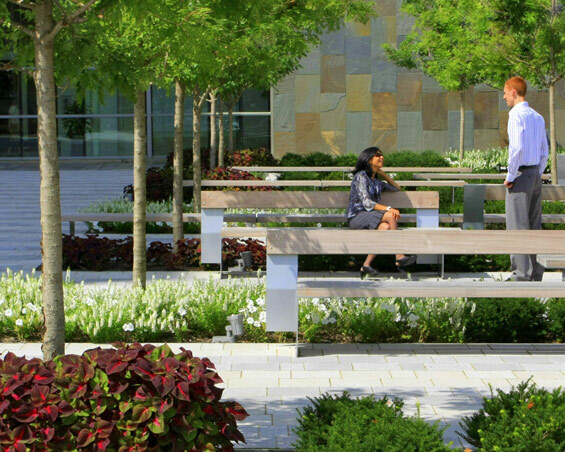 The South Green draws people outdoors from the headquarters and invites people from the surrounding neighborhood to enjoy it as well. The perimeter is barrier free and is observed by a security employee on bicycle and passively by staff. Two parking lots were removed, mature existing trees were preserved, lawn panels were regraded, a lighted perimeter walking path was added along with plantings that loosely reinforce the green’s perimeter and internal spaces. What was a collection of disparate spaces consisting of remnant trees and paving from earlier decades was reconstituted and shaped to provide an attractive, cohesive park space that serves private and public users. 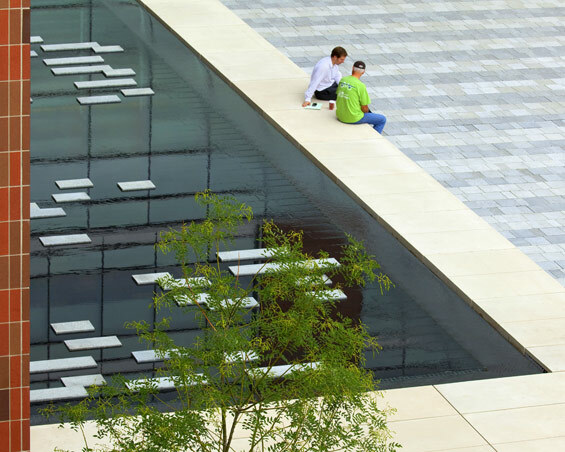 Water Feature: Dan Euser Water Architecture, Inc. Contractors: John Woods (NBBJ), Peabody Landscape Group, Igel, Georgia Fountain Co., Dyna Electric.